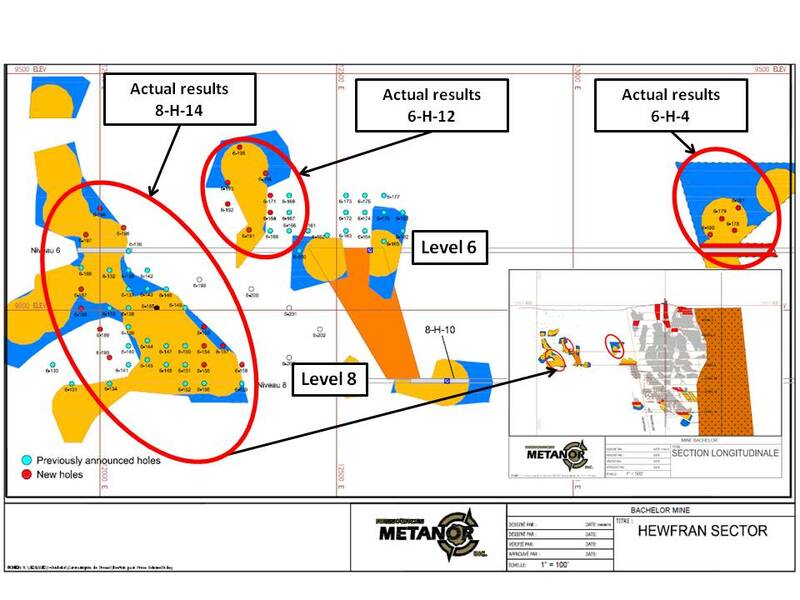 These holes demonstrate the concentration of gold mineralization between level 4 and level 8 in the Hewfran sector (See the longitudinal section for the holes location). The development activities are presently within 50 meters from the 8-H-14 sector. The construction of a diamond drill bay on level 8 is planned in October to drill below toward level 10 and 12. The development activities reached the mineralized zone in the 6-H-10 last week. The average width of the ore is 4.0 meters over the first 11 m of sill excavated. The grade to date is 11.4 g/t over the excavated length. The vein remains open to the east and west. The true width is between 60 and 80% of the core length obtained in diamond drill holes. The cap-off grade used in the analysis is 31 g/T or 1 oz Au. The samples were assayed by fire-assay at the Metanor assay lab. The quality control program of the assay results (QA QC) adopted by Metanor includes a minimum of 10% of controlled assays being conducted as well as verification by an independent external assay lab. Pascal Hamelin, P.Eng, Vice-president of Operations, is the Qualified Person under NI 43-101, responsible for reviewing and approving the technical information contained in this news release.